For 150x15mm plates: 10 plates/sleeve and 10 sleeves/case. Please refrigerate plates upon arrival. If space allows, we include 10% extra of agar plates in shipments to compensate any possible plate loss caused by contamination and rough shipping handling etc. Please exam the condition of the plates upon receiving and let us know any serious problems in five working days. LB Agar plates: 1% NaCl, 1% Tryptone, 0.5% Yeast Extract, 1.5% Agar. *: Ampicillin vs Carbenicillin: Ampicillin sodium looses its activity quickly after reconstituted in water. Please store the Amp plates at 4oC upon receiving and use them within seven days. Carbenicillin is more resistent to heat and low pH, is a good substitute for ampicillin in growth media. It also reduces presence of colony satellites. Nutrient Agar Plates: 0.3% Beef Extract, 0.5% Peptone, 1.5% Agar. 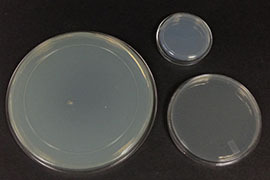 NGM (Normal Growth Medium) Plates: 0.25% Peptone, 51mM NaCl, 25mM [PO4], 5ug/ml Cholesterol, 1mM CaCl2, 1mM MgCl2, 2% Agar. **: Non-vented vs Vented plates: For non-vented plates, inner surface of their lids is flat, lids sit right on top of the bottom dishes. For vented plates, inner surface of the lids has three breather logs, elevating the lids slighly from the bottom dishes. The design results in better aeration in vented agar plates than in non-vented plates. Bacteria liquid culture seeded on vented agar plates dries faster and forms thick lawn than that on non-vented ones. However, vented agar plates get drying out or contaminated easier than non-vented plates do. HGM (High Growth Medium) plates: 2% Peptone, 51mM NaCL, 25mM [PO4], 5ug/ml Cholesterol, 1mM CaCl2, 1mM MgCl2, 2.5% Agar. Applications: Peptone is 8 x more than that of NGM plate. When the plates are seeded with Na22, they will yield very thick bacterial lawns, suitable for growing large quantity of worms. RNAi plates: 0.25% Peptone, 51mM NaCL, 25mM [PO4], 5ug/ml Cholesterol, 1mM CaCl2, 1mM MgCl2, 25ug/ml Carbenicillin, 1mM IPTG, 2% Agar. MYOB plates: per liter: Peptone 3.1g, NaCl 2g, Tris-HCl 0.5g, Tris-OH 0.24g, Cholesterol 8mg, Agar 20g. YPD plates: 2% Dextrose, 2% Peptone, 1% Yeast Extract, 2% Agar.